Brief introduction to basic features and workflow of template-based thermal analysis. Additional details can be found in the Overview section in Chapter 1 of the SYMMIC Users Manual. This tutorial demonstrates how to adjust the display of a device model using the mouse and commands in the View and Settings menus. You will learn how to rotate, pan and zoom the device, how to slice the model and restore the original view, how to use the mouse to probe the positions and names of components in the model, and how to add a wireframe to delineate components. The demo covers most of the material in Chapter 2 of the SYMMIC Users Manual. This tutorial describes two device templates, the mesa resistor and generic FET templates, that can be used for thermal analysis of integrated circuits. You will learn how to modify the templates parameters to reconfigure the analysis, and how to get information about the template parameters from the template help file. The material covered can be found in Chapter 5 of the SYMMIC Users Manual. Demonstration of thermal analysis on a published FET design, starting from the generic FET template. Learn how to configure the parameters to match the FET design, how to eliminate layers and vias, how to enter new material properties, and to quickly reproduce experimental measurements. The tutorial is similar to the analysis described in the Generic FET Validation section of the SYMMIC Users Manual. 1. Configure a template for each device where power is dissipated. 2. Create a layout to define MMIC dimensions and set device locations. 3. Set dissipated power levels and run the simulation. 4. You will learn how to configure the parameters to match the FETs in the amplifier, and how to create and edit a layout describing the positions of the FETs in the MMIC. The steady-state temperature distribution for constant ON power is examined. The tutorial follows the MMIC Thermal Analysis section of Chapter 5 of the SYMMIC Users Manual. This tutorial demonstrates how to use a spreadsheet such as OpenOffice Calc to setup thermal analysis on a set of 18 different FET designs, how to run the cases sequentially using the command line utility xSYMMIC.exe, and how to copy the results into a spreadsheet for plotting. The complete example is detailed in the Command Line Simulations section of Chapter 6 of the SYMMIC Users Manual. 1. Export MMICs onto module layers. 2. Export other heat sources onto module layers. 3. Create T/R module layout and add exported devices. 4. Run T/R module thermal analysis. 5. Export T/R module onto LRU layers. 6. Create LRU layout and add T/R modules. 7.Export other heat sources onto LRU and add to layout. The tutorial is taken from Chapter 5 of the SYMMIC Users Manual, from the section entitled Use of Export to Model a T/R Module and LRU. This tutorial demonstrates how to extract boundary conditions from a subsystem analysis and apply them to a detailed thermal analysis of one MMIC in the subsystem. For more details see the section entitled Use of Export to Model a T/R Module and LRU, in Chapter 5 of the SYMMIC Users Manual. This tutorial shows how to perform thermal analysis of a FET when power is switched On and Off in a square wave pattern. Power is delivered as a 33% duty cycle of 75 microseconds. An electrical circuit analogy is used to explain the time constants involved in the temperature transients. You will learn how to set initial conditions to quickly arrive at the final temperature swings for the device. A preview of a new tool that facilitates the production of device templates from GDSII layout files. 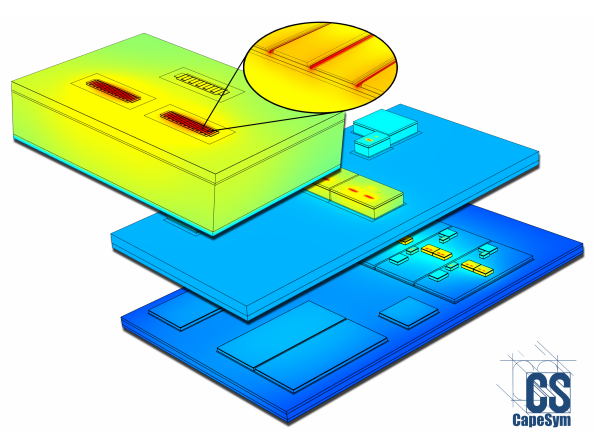 Learn how to create a template for a device that can be used to quickly perform device-level and integrated circuit-level thermal analyses in SYMMIC. A heterojunction bipolar transistor thermal analysis is performed as an example. Thermal analysis of a MMIC design is facilitated by a script in AWR Design Environment that allows a user to select individual circuit components for inclusion in a layout template for SYMMIC. This video demonstrates the use of the script on AWR's MMIC_HPA example. This video demonstrates how to off-load thermal analysis computation onto a high-performance computer running in Amazon's Elastic Compute Cloud, instead of running the simulation on your desktop.